Stevie Nicks hinted earlier this year that she might release some older songs that had never seen the light of day. Now, she's making good on that tease: her new album 24 Karat Gold -- Songs from the Vault is due October 7. According to Stevie, the album features mostly songs written between 1969 and 1987, with two that were written in 1994 and 1995. "Each song is a lifetime. Each song has a soul. Each song has a purpose. Each song is a love story," she says in a statement. "They represent my life behind the scenes, the secrets, the broken hearts, the broken-hearted and the survivors. These songs are the memories -- the 24 karat gold rings in the blue box. These songs are for you." The artwork for the album includes never-before-seen Polaroid photos taken by Stevie throughout her career. 24 Karat Gold -- Songs from the Vault is available for pre-order starting August 5. 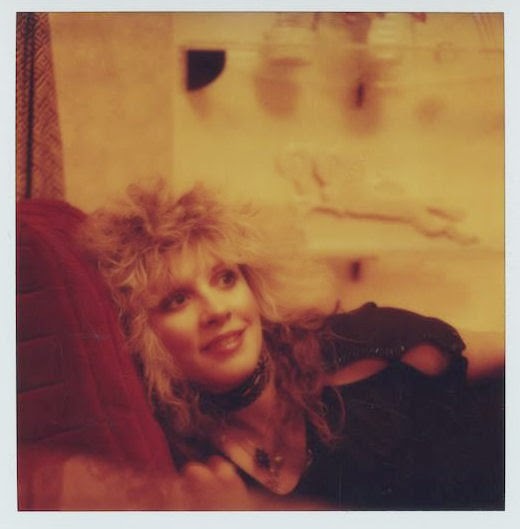 That same day, Stevie will debut her new, official Instagram account, StevieNicksOfficial, where she'll begin previewing snippets of the music. In addition, a limited edition double vinyl version of 24 Karat Gold -- Songs from the Vault will come out September 29. Also available will be a Deluxe Photobook CD, which will include two bonus tracks, as well as 48 pages of exclusive photos from Stevie's personal collection. Stevie and Fleetwood Mac will hit the road for their On with the Show tour -- featuring the return of Christine McVie -- starting September 30 in Minneapolis. Tickets available at Ticketmaster. Album will focus on songs the Fleetwood Mac frontwoman wrote between 1969 and 1987. Stand Back: Stevie Nicks is preparing to unleash a new solo album. Will join Fleetwood Mac bandmates for 'On with the Show' tour beginning Sept. 30 in Minneapolis. Well - here we go...seems official. October 7th is a Tuesday, the day albums do come out so this story seems credible. Love the CD photo book with 2 extra tracks reference (since I no longer have a turn table - I do the CD thing). Any tips on where we can get the vinyl?! Amazon? Love you nickslive/fmnews. Love the concept of the poloroids! Stevie was the inventor of Selfies! :) The photo release is beautiful and would be great as front artwork. I recall seeing vinyl LPs at Best Buy if you want to pick it up locally. Amazon will most likely offer the vinyl set as well. Warner Bros website has a STORE where it is just for Vinyl. GO there, its easy - dont make it tough on yourself. maybe do a signing of the cd in Boston Stevie, on the 8th or 9th after the todays show! please Stevie you did dvd signing in Chicago 2008 in ny and iyd's in La last yr. So keeingp my fingers crossed. All fabulous news, absolutely fabulous. I always HATE to write any comment that even hints at sounding negative, but... is this really the cover photo for the album? It's nostalgic and interesting but I'd prefer a pic that looks a little less, shall we just say... "glassy-eyed". Did anyone else have that first reaction also? I just watched Master Class again and Stevie clearly decries all her old photos where she looked "high". Her exact word. Is this the COVER photo of the new cd/album?...I thought it was just a sample of one of the polaroids in the photobook?? I hope that's not the cover. It's probably not the album cover ... Even though she's the album sleeve and deluxe photo book with past Polaroids, I would imagine a current photo of Stevie will grace the cover. I could be wrong, but I would think there would be at least one current photo. That photo cannot be the cover. It's not even a good photo and she looks as high as a kite. That would be an extremely tacky cover. I'm afraid that that is the album cover.... Uh oh. oh hell no! That better not be the album cover. Can't wait for the new album. I don't mind the album cover. I don't know why everyone's so upset about it. I just read on another site were stevies new album cover will be made up of various polariods that will be posted on her intagram page. I wonder if it's true.? Still can't wait for Tuesday to pre-order.